Golf: The Sporting Blog talks life lessons, art, design and fashion with entrepreneur and avid golfer Liz Harwood. Liz Harwood is an entrepreneur, designer, artist, mum of three and an avid golfer. The Sporting Blog sat down for tea for two, and got the inside scoop on how Golf, Art and Fashion relate to each other in her world. Oh, and this isn't a paid promotion, we just like Liz and what she has to say about life. Plus the business is pretty cool. The Sporting Blog : To put everything into context, when did you actually start playing Golf? What were your reasons for taking up the game? Liz Harwood : I started playing Golf before I had the children, so over 20 years ago. It was a way of doing something together with my then husband. I obviously didn’t get very far with that because I kept getting pregnant with my daughters! We moved to Lanzarote and got back into it. Thereafter when I returned to the UK my then 74 year old Dad would take me to the driving range and it was a nice thing to do together. But it was 2010 that I really took it up properly. It was mainly a way to meet up with a specific girlfriend who was always playing! So from around November 2010 I got seriously addicted. TSB : So you got the bug? LH : Beyond the bug! I was so addicted at the time that I’d play 18 holes, drive home and make supper and then whizz back out for another 9 in the evening. 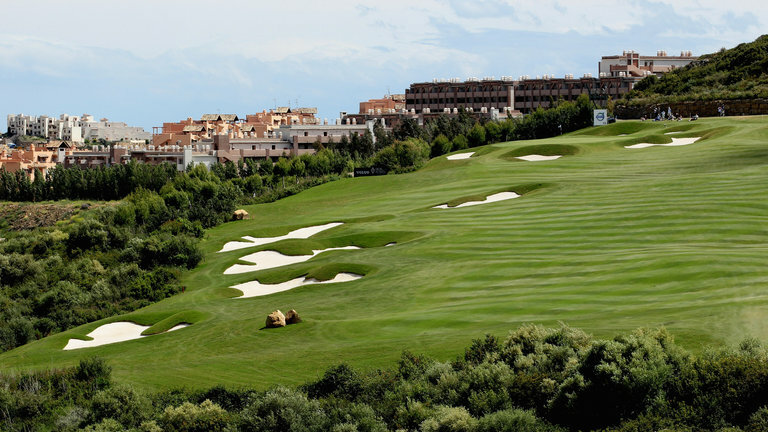 I started going on 5 day golf tours to Spain and became really passionate about the game. So I would have been around 40 something back then, and my friends and I that played were all quite ‘sassy’ women. So it was a massive disappointment to go into pro shops and not see much women's clothing, mainly because there are too many sizes for the pro shops to stock. If there were women's clothes in there, they typically looked at what a bloke would wear and made it in pink. So in 2014 I started sketching some designs for golf clothes for women. I looked back at when my Mum played in the 1940’s and she wore these lovely long pleated skirts with a cardigan,a belt at the waist and with brown brogues. She just looked so stylish. At that stage it was not about my art, I just wanted to start a brand for ladies that wanted to look good on the fairways. Life got in the way with that one but shortly after I started to explore how to put my art onto fabric, and furthermore had samples made of golf clothing with the art as a design feature... and that led to FAMARA and what I’m doing now. TSB : So Golf has been part of your story, but what does it do for your work life balance? LH : Golf for me was always about being my kind of Buddhism. It was a sort of meditation. Golf is a game you play against yourself, if you cheat you're only cheating yourself. For me, for 4-5 hours I’m focused only about getting this little ball around the course, so whatever other dramas were going on in my life were set to one side. So it was the most calming thing for me being out in the open air, feeling fit and getting lots of exercise. TSB : And how about the social aspect of golf? Did you meet a lot of people whilst playing? LH : Most of my friends now are from golf. At the stage I was playing we’d all had our children, and whilst they are at school you make a lot of friends like that and it’s harder when they are grown up to see those people. At my club I played in a lot of competitions, which of course introduces you to a lot of people. Even more so if you are away for a social weekend and so on. TSB : On a personal note, what was the biggest challenge with regards to playing golf for you? LH : For me and the majority of ladies I play with the biggest challenge was learning to get the head down and over the ball. That was the key. I learned so many different techniques to do it! Once I grasped that I started saving shots all over the place. A lot of people also refer to the challenge of having enough time to play. TSB : Sure, especially with a busy life and children, finding that time must have been hard? LH : Yes, the amount of time it took up was a challenge, but I try very hard to set aside the time, say a Sunday, that is golf day. TSB : Have any of the things you’ve learned playing golf helped in your professional life? LH : Only in terms of clearing the head. If your head is foggy or muddled up it’s not good for creativity. It is great stress reliever too. I have had rounds where we might be crying on the front nine and laughing on the back nine! You know, we were all living difficult corporate lives, working in stressful environments. It might be a cliche but beating the hell out of a little ball does help. After a round and a drink I’d just feel so much better. TSB : You mention playing in Spain and other places; A lot of your art is landscape based, were you ever inspired by any places that you played in particular? LH : Well the one in your office, of the castle (A Sporting Blog early Xmas present last year) is from Donnington Grove but in general no, as most of my work is quite nautical. TSB : If you could play anywhere in the world, whether they have a course there or not, where would that be? LH : I'd love to play more in Spain, the weather is amazing of course, and makes golf so much more rewarding. My favourite course there is Finca Cortesin. South Africa is certainly on my bucket list, Cape town with the sea and table mountain in the distance,would be amazing. TSB : So your golfing inspiration is varied and linked to a number of aspects of your life, was it the same for FAMAR? LH : The inspiration for FAMARA was really based on a mantra I would say to myself every day which was “It’s easy making money doing what you love”. So I thought I better define what I loved. So I wrote down Art, Golf, Fabric, a beach in Lanzarote called Famara, and I tried to join all the dots. So the art combined with the fabrics and the idea of the golf clothing developed into other clothes and furnishings and it developed like that. The goal is to launch the golf side of FAMARA next year at some point, as well as further grow what we have done so far with the fabrics, accessories and home furnishings.